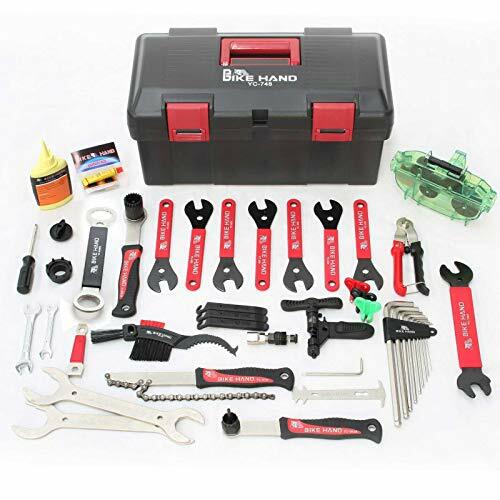 The BIKEHAND Complete Bike Bicycle Repair Tool Kit offers different tools for fixing and doing other minor tuning on your bicycle. These tools are designed to standard and are made from tough and durable materials to withstand wear and tear associated with frequent usage, and they always get the job done. The bikehand company is known for making quality products and this is not an exception. This toolkit offers a cost saving solution to DIY-ers as you only spend a small amount for these tools and save yourself the stress and cost of visiting maintenance shops for costly repairs. Nine different sizes of Hex Set of Wrench tools. Comes with bottom brackets for Campagnolo and Shimano compatible lockring tools for the free hub. 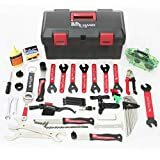 The BIKEHAND Complete Bike Bicycle Repair Tool Kit is a very handy toolkit for enthusiasts as well as learning how to do minor repairs. For a small price, it comes with all the basic essential tools needed for most DIY activities. From complete overhaul, total reassembly and disassembly, to basic maintenance, this tool offers the complete solution. The toolbox does not come with extra spaces for your own tools so this means if you have other tools not included you want to add, you have to get another box for tools probably. If you are looking to save costs from repair visits to shops, then this a must get product.